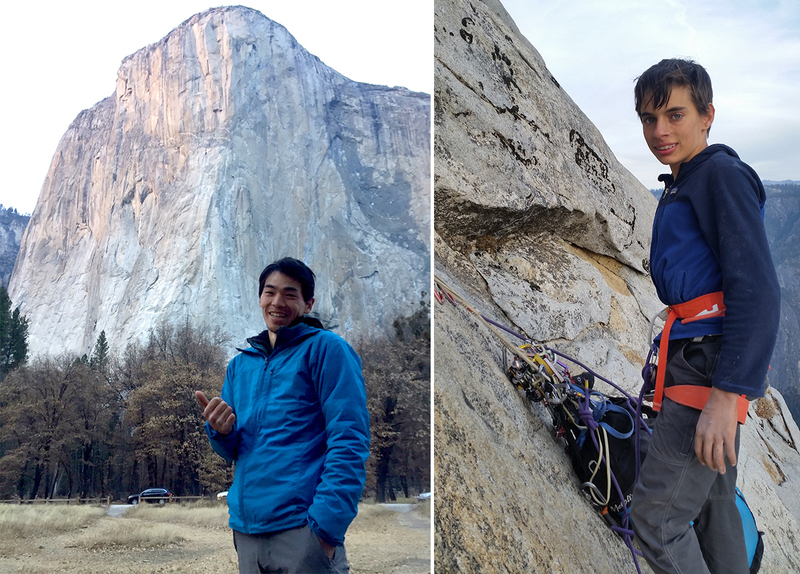 Two historic free ascents happened within the last several days on the Nose (VI 5.14a, 2,900') of El Capitan: Keita Kurakami free climbed the route as a rope-solo in a single push from the ground on November 14-18, and 15-year-old Connor Herson free climbed it in a three-day push with his dad belaying and cleaning every pitch; they topped out on November 19 after three days on the wall. Kurakami redpointed every individual pitch on the Nose last year but decided that he wasn't satisfied with his style because he didn't free the route from the ground in a single push. "I will come back again to climb it in better style," he said at the time. "I've been told my ascent can be accepted as a free ascent, but even so, if I myself have doubts about [its validity], I can't accept it. Being honest with myself is the most important thing for me." This year he returned and completed his rope-solo free ascent in a five-day push using a Grigri+ and two lengths of 8.1mm rope (70m and 42m). He said this was his first time rope-soloing a big wall. Of his Nose ascent, Kurakami said, "I sent almost all the pitches on the first try. But I took a fall on the Great Roof and Changing Corners [the crux pitches]. In total, I fell about 10 times [before redpointing the pitches cleanly].... But I knew the route well because I took three years, maybe more than 100 days [to project it]." When asked about the most challenging moment of the climb, he said: "To decide to do it and tell my wife about the plan! After that, I just got into a flow and just had to believe in myself." The rope-solo was not his original strategy. He'd intended to climb the route with a partner, but his friend injured his ankle and couldn't climb. 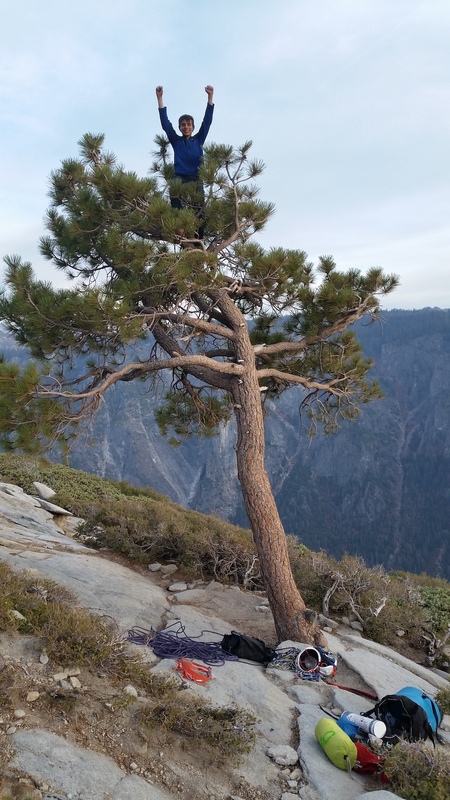 One month before my departure to Yosemite I lost a climbing mentor who died in the mountains*. He was the best, most modest climber and alpinist I knew. He was a co-worker of mine and often climbed solo but he never bragged about his accomplishments and did not accept compromises in style. I learned many things from him: ethics, mind and humility. He was a really warm human and a well-loved friend. We promised to climb together someday when I grew up to be a climber like him. I feel sad about his death and even lost motivation to climb. But then I thought, I have to climb. Because I'm a climber. I thought that it was karma for me. I thought, I have to do this as a solo, whether it would lead to success or failure, so that I can be satisfied. It was a way to offer a cup of wine to the memory of my friend. Kurakami is known for bold trad climbing, and he wrote a story for Alpinist 56 titled "A Thousand Days of Lapis Lazuli" about the first ascent of Senjitsu no Ruri (5.14a R/X, 250m, 7 pitches, Kurakami-Sato). In April 2017 he completed the first free ascent of another heady trad line that he named Votive Light (5.13d/14a R). "When on a couple weekend days late last spring they checked out the Changing Corners pitch, it was to investigate long-term project potential. But everything Connor has done his whole climbing life has helped prepare him for this, so the multi-year schedule, also, was cut short." While his young age has understandably caught lots of attention, it was actually his weekender style that was the most historically significant. [He didn't use any fixed ropes to rehearse the crux] and it was...certainly the first time it was done as a [weekend climber]. He spent 16 days total on the route, spread between this spring and fall. All were one- or two-day weekend trips with a nine-hour round-trip drive. Most of the time was just spent on logistics hiking up to the top of the Nose to work the Changing Corners or climbing up to the Great Roof. The Changing Corners was worked using one 60-meter rope to rap in. Actually climbing time working the crux pitches was maybe an hour per trip and once just 15 minutes after climbing up to the roof. Most importantly, no days of school were missed in the sending of this route! Conner came very close to succeeding on his first real attempt to lead the route from the ground on the previous weekend. He came within a foot of freeing the Nose! He also got to take his first 25-foot whipper. His piece held! It was his first time leading the Great Roof and Changing Corners. Although he's worked them on [toprope], I spent the entire drive preparing him for how it's a whole new ballgame on the sharp end of these seriously dicey leads. This trip was to get used to wall life and figure out gear placements. He, of course, ignored me and came within a finger lock of hiking the Great Roof and Changing Corners first go! He sent the Roof [second try] and gave four excruciatingly close burns on the Changing Corners. It was the most try-hard I've ever had the pleasure of watching. He dumped his heart into it. The tank was bone dry after his fourth go. Although apparently not that bone dry as he then sent the way spooky exit 12c in the dark! It was a three-day ascent.... He was no falls to the Changing Corners on the second day. He might have been able to top out that day but there were fixed ropes left by [a]...free climber in the middle of the Changing Corners. By the time I moved them there was only time for one burn. He came within inches of nailing the Changing Corners on the first go! [After] a small rest...I think he could have redpointed it but it was too dark. The next morning he sent. The quote of the day was from last week. He hadn't climbed much this fall [because of] running cross country. So after he redpointed 30 out of 31 pitches, including two hard goes on the Great Roof and four all-out burns on the Changing Corners, [he said]: "You know dad, I don't have my endurance. I need to start climbing again." He then went to the bouldering gym the next day to "build endurance." He has no idea of the historical significance of his ascent. It's kind of funny. 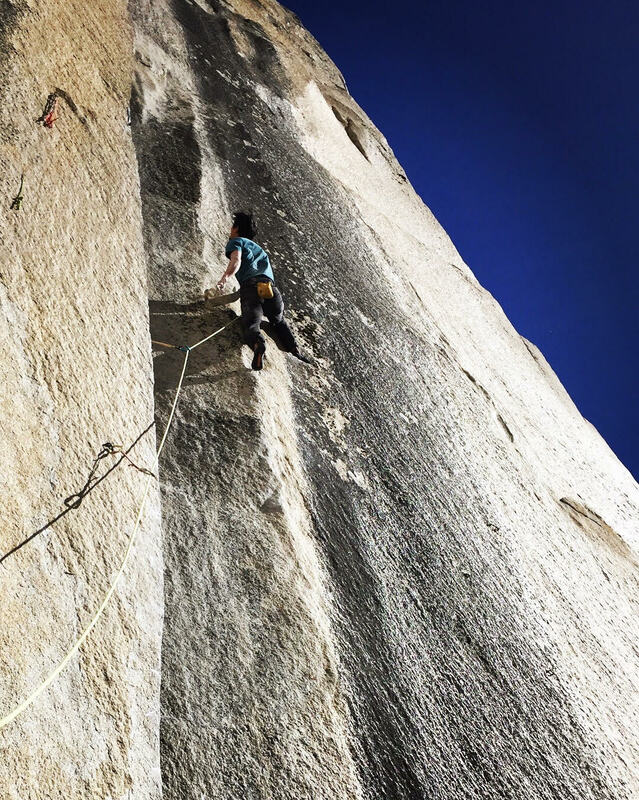 He has no social media and only a small group of his climbing buddies even know what climbing El Cap, by any style, entails. My social media blew up but he only got three texts from his buddies commenting on his poop tube decoration. 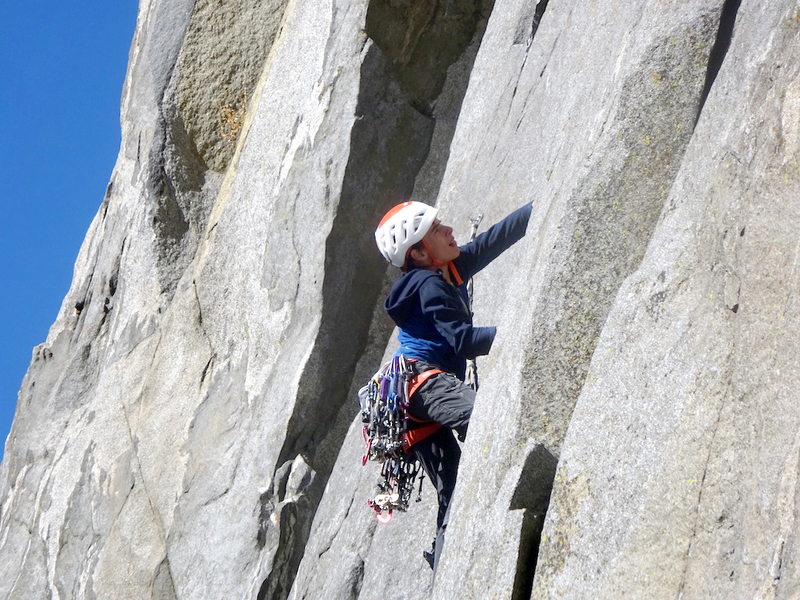 Upon topping out, Connor placed a locking carabiner that once belonged to Tim Klein, who died with Jason Wells while they were speed climbing the Salathe on June 2. Both men were friends with the Herson family. 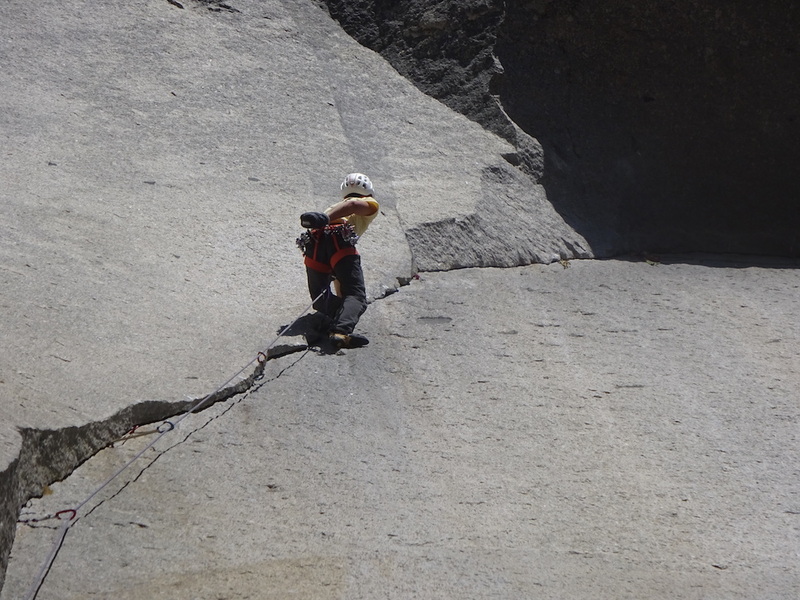 There have been several other impressive ascents in Yosemite over the past few months as well. On November 8, Carlo Traversi became the second person to climb Meltdown (5.14c), a desperately thin tips crack that had thwarted all would-be second ascensionists since Beth Rodden's first ascent in February 2008. 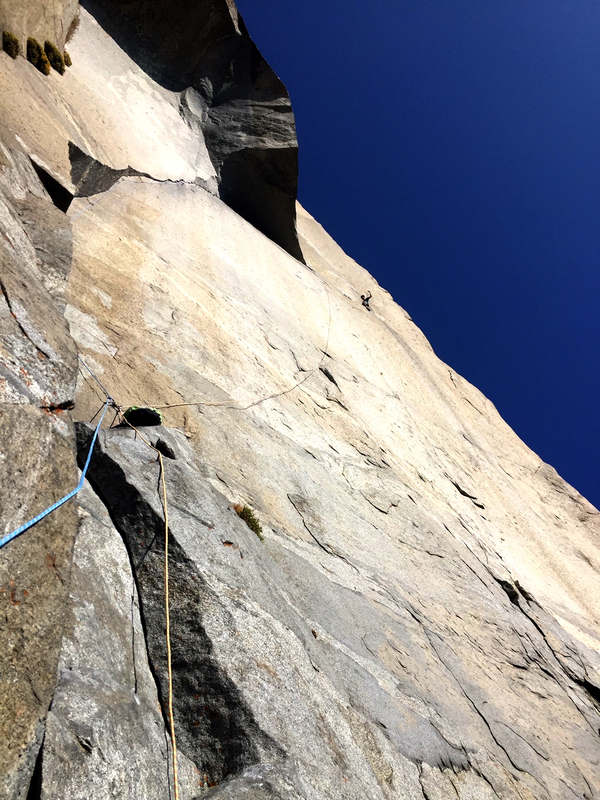 Then, on November 14, Lonnie Kauk became the first to climb his dad's (Ron Kauk) famous testpiece Magic Line (originally 5.14b) by placing all protection on lead, which Lonnie said upped the grade to 5.14c. Magic line had previously only been climbed with at least some of the gear preplaced, which Lonnie had done prior to his latest ascent. More details about those and other recent ascents can be found here.